The original award-winning board game! Sketch, sculpt, solve puzzles, act, hum and answer questions Perfect for parties, reunions, after dinner, vacations — anytime! Each game lasts about an hour — hilarity guaranteed Cranium is the outrageous, award-winning board game packed with something-for-everyone fun! Whether you're an aspiring actor, artist, data hound or wordsmith, Cranium gives you a chance to shine. Cranium brings families and friends together — after dinner, at parties, on rainy afternoons. When you play Cranium, you'll use your brain in ways you never imagined and find yourself doing the unexpected. And the fun doesn't end when the game does — you'll never forget your uncle impersonating Britney Spears, your sister acting out "ants in your pants", your mom spelling "platypus" backwards or your best friend sculpting "platform shoes" out of clay! Cranium helps people find the fun in all things and brings light and laughter to the lives of people who play. This game is easy to set up, and doesn’t have a lot of pieces. The only problematic component is the modelling clay, used in some of the creativity challenges: it can dry out if not properly cared for and become useless. So, take good care of it! Cranium combines a bunch of classic party games and variations thereof. It has trivia elements, puzzle elements and bits of games like ‘Charades’ and ‘Pictionary’. The trivia element is not too esoteric, nor are the puzzles. There are anagrams, multiple choice questions and spelling-bee challenges. The most entertaining parts of the game are the performance and creativity aspects. One member of a team will variously have to do an impression of a celebrity, hum a melody, draw a picture (sometimes with their eyes closed! ), perform charades or model something out of clay to get their teammate to guess the clue on the card. Some of the clues can be really hard to draw, mime or shape–but the game wouldn’t be fun if it were too easy. Charades is fun. Pictionary is fun. Trivial Pursuit is fun. Cranium takes all these and more and blends them together into one big game. It’s nice because the variety keeps things fresh. Nobody complains because they “can’t draw” or “are no good at trivia” because they are only tiny pieces of the game. You can still be good at knowing music, acting like famous people, making things with clay, or word games and spelling. There’s something for everybody! Once you’ve played the game too many times, I’d say 20 or so, the cards will be too repetitive. That’s why they make expansion cards sets! I know Cranium gets a lot of flack from the elite circles of gaming, but I’ve always had a fun and enjoyable time when playing with a group of willing participants. The key word there is “willing”, because if anyone in the group is shy or reluctant to join in on the fun, it can drag the game down (as with any party game, I’m sure). My father-in-law, for example, is not artistic and doesn’t keep up on pop culture, so whenever we play Cranium, he sits it out. The game itself is a wonderful combination of Trivial Pursuit, Pictionary, Charades, and other game types that really add diversity to the playthrough. Some teams tend to focus more on answering trivia, and others like to model the clay or perform in order to move along the track. Games do tend to run a bit long, and my group generally tends to run out of steam by the end, but the majority of the game is a raucous good time. Cranium is a game that combinds multiple elements of arts, facts, theatre and literature into a fast paced easy to pick up board game for many, and because of the variety of catagories there will be something for everyone. Great for the whole Family or large group, young ones are able to play this game in a group of adults because even if they can’t do the trivia questions there is an equal amount of sculpting, drawling, and charades that they can handle in the Creative Cat or Star Performer. However, if your group is a shy then this isn’t the game for you. It requires making fun of yourself, being loud and fast to yell out answers on time. I only game this game a four on replay ablity bacuase unless you buy on expantion you will quickly leran the answers to trivia question cards. But there are a good amount of included cards to keep you going for at least 4-5 games. This game has been labeled the “Whole Brain” game for a reason. The guys who created it felt there needed to be a game that could appeal to those who wanted to use multiple skills. Unlike some other games that can get to be monotonous, I like this game because you have a variety of things to do. This is a great team game too because you get to utilize different players talents, skills and knowledge. Everyone can contribute something. You get your trivial pursuit, sensosketch, spelling bee, charades and sculpting all in one, along with some other fun activities mixed in there. This has been a favorite for some time and after the amount of times we’ve played it, it’s still fun because of the variety! Cranium got played twice in my house before the clay was lost. We thought about replacing it with the kid’s play dough, but shelved the game because it didn’t hold our interest enough to want to bother again. My wife and daughter both prefer Dicecapades (with the expansion/travel set to double the cards) over Cranium. We just found Dicecapades more consistently fun (and still creative and educational for the younger players). Possibly it was just that not everything in Cranium was “fun” for us, as I’m not generally a huge fan of games that try to merge too much stuff together. Cranium to me was too much of a mash-up where I felt many tasks were less fun than others. Plus we love dice…lol. We played this game for awhile, but it gets old. I think it tries to do too much, and I start to feel like I’m at a business retreat learning team-building skills. It’s not my favorite. 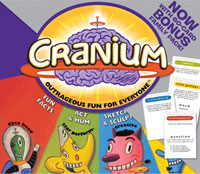 Cranium is an excellent choice when your group can’t decide if it wants to play a trivia game, charades or Pictionary. It has a pretty good selection of questions and challenges, which should appeal to each type of player. The trivia questions vary wildly in difficulty. Not a great choice for those not familiar with American pop culture. This game is a blast, but unfortunately it is not for all. As such, I don’t get to play as often as I’d like. This game is a great combination of charades, trivia, pictionary, art class, and super-crazy fun. It’s great for friends or family and can pull the star out of anyone. Usually, once people get over their initial shyness at playing, they have a WONDERFUL time. The game is best played with a good sized group of people. I wouldn’t want to play the game with less than 6 (3 pairs of people). I have found playing as pairs and not as a team of more than 2 is better and a little less chaotic. Be careful with the bits and pieces of the game. And make sure the game claydough is kept tightly shut to prevent it drying out. I brought this little gem with me to college and aside from video games, this was played the most. It takes a bit longer to complete than I think would be ideal, but we all somehow managed to make time for it. I haven’t played it since getting out of school, but I am hoping to find a group I can pick it up with again. Most of the time we have non gamers over. This is the game we end up playing. Just the right level, where everyone is able to contribute something to the game. Unlike Trivial P, where you feel like a dumbass half of the time. This is an almost classic party game. There’s a lot of variety in the types of game play available and it should appeal to a wide range of people. The main problem is that you really do need 4 people to play so unless you’re throwing a party or having a board game night this one doesn’t get much use around the house. Easy enough party game for anyone. I only know of a few people that hate the game, and thats because they can’t develop a strategy and win it. Not everyone is good at everything, as players will find out! But does get a bit old during the finish. Like a ‘hurry up and finish so we can do something else’ vibe. Add a Review for "Cranium"